For the technique of performing basic arithmetic, see Algorism. "Octopod" by Mikael Hvidtfeldt Christensen. An example of algorithmic art produced with the software Structure Synth. Algorithmic art, also known as algorithm art, is art, mostly visual art, of which the design is generated by an algorithm. Algorithmic artists are sometimes called algorists. 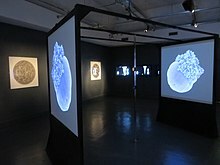 Algorithmic art, also known as computer-generated art, is a subset of generative art (generated by an autonomous system) and is related to systems art (influenced by systems theory). Fractal art is an example of algorithmic art. For an image of reasonable size, even the simplest algorithms require too much calculation for manual execution to be practical, and they are thus executed on either a single computer or on a cluster of computers. The final output is typically displayed on a computer monitor, printed with a raster-type printer, or drawn using a plotter. Variability can be introduced by using pseudo-random numbers. There is no consensus as to whether the product of an algorithm that operates on an existing image (or on any input other than pseudo-random numbers) can still be considered computer-generated art, as opposed to computer-assisted art. Islamic geometric patterns such as this girih tiling in the Darb-e Imam shrine in Isfahan, are precursors of algorithmic art. Roman Verostko argues that Islamic geometric patterns are constructed using algorithms, as are Italian Renaissance paintings which make use of mathematical techniques, in particular linear perspective and proportion. Paolo Uccello made innovative use of a geometric algorithm, incorporating linear perspective in paintings such as The Battle of San Romano (c. 1435–1460): broken lances run along perspective lines. Some of the earliest known examples of computer-generated algorithmic art were created by Georg Nees, Frieder Nake, A. Michael Noll, Manfred Mohr and Vera Molnár in the early 1960s. These artworks were executed by a plotter controlled by a computer, and were therefore computer-generated art but not digital art. The act of creation lay in writing the program, which specified the sequence of actions to be performed by the plotter. Sonia Landy Sheridan established Generative Systems as a program at the School of the Art Institute of Chicago in 1970 in response to social change brought about in part by the computer-robot communications revolution. Her early work with copier and telematic art focused on the differences between the human hand and the algorithm. Aside from the ongoing work of Roman Verostko and his fellow algorists, the next known examples are fractal artworks created in the mid to late 1980s. These are important here because they use a different means of execution. Whereas the earliest algorithmic art was "drawn" by a plotter, fractal art simply creates an image in computer memory; it is therefore digital art. The native form of a fractal artwork is an image stored on a computer –this is also true of very nearly all equation art and of most recent algorithmic art in general. However, in a stricter sense "fractal art" is not considered algorithmic art, because the algorithm is not devised by the artist. In light of such ongoing developments, pioneer algorithmic artist Ernest Edmonds has documented the continuing prophetic role of art in human affairs by tracing the early 1960s association between art and the computer up to a present time in which the algorithm is now widely recognized as a key concept for society as a whole. Letter Field by Judson Rosebush, 1978. Calcomp plotter computer output with liquid inks on rag paper, 15.25 x 21 inches. This image was created using an early version of what became Digital Effects' Vision software, in APL and Fortran on an IBM 370/158. A database of the Souvenir font; random number generation, a statistical basis to determine letter size, color, and position; and a hidden line algorithm combine to produce this scan line raster image, output to a plotter. Fractal Art is not..Computer(ized) Art, in the sense that the computer does all the work. The work is executed on a computer, but only at the direction of the artist. Turn a computer on and leave it alone for an hour. When you come back, no art will have been generated. "Algorist" is a term used for digital artists who create algorithmic art. Cellular automata can be used to generate artistic patterns with an appearance of randomness, or to modify images such as photographs by applying a transformation such as the stepping stone rule (to give an impressionist style) repeatedly until the desired artistic effect is achieved. Their use has also been explored in music. Fractal art consists of varieties of computer-generated fractals with colouring chosen to give an attractive effect. Especially in the western world, it is not drawn or painted by hand. It is usually created indirectly with the assistance of fractal-generating software, iterating through three phases: setting parameters of appropriate fractal software; executing the possibly lengthy calculation; and evaluating the product. In some cases, other graphics programs are used to further modify the images produced. This is called post-processing. Non-fractal imagery may also be integrated into the artwork. Genetic or evolutionary art makes use of genetic algorithms to develop images iteratively, selecting at each "generation" according to a rule defined by the artist. Software is unique in its status as metaphor for metaphor itself. As A universal imitator/machine, it encapsulates a logic of general substitutability ; a logic of ordering and creative, animating disordering. Joseph Weizenbaum has argued that computers have become metaphors for "effective procedures," that is, for anything that can be solved in a prescribed number of steps, such as gene expression and clerical work. The American artist, Jack Ox, has used algorithms to produce paintings that are visualizations of music without using a computer. Two examples are visual performances of extant scores, such as Anton Bruckner's Eighth Symphony and Kurt Schwitters' Ursonate. Later, she and her collaborator, Dave Britton, created the 21st Century Virtual Color Organ that does use computer coding and algorithms. ^ Hvidtfeldt Christensen, Mikael. "Hvitfeldts.net". Retrieved 2 October 2015. ^ a b c d "Approximating Reality with Interactive Algorithmic Art". University of California Santa Barbara. 7 June 2001. Retrieved 25 December 2015. ^ a b c d e Verostko, Roman (1999) . "Algorithmic Art". ^ Flanagan, Mary. "An Appreciation on the Impact of the work of Sonia Landy Sheridan." The Art of Sonia Landy Sheridan. Hanover, NH: Hood Museum of Art, 2009, pp. 37–42. ^ Ernest Edmonds (15 January 2018). "Algorithmic Art Machines". Arts. doi:10.3390/arts7010003. Retrieved 27 January 2018. ^ a b Mitchell, Kerry (24 July 2009). Selected Works. Lulu.com. pp. 7–8. ISBN 978-0-557-08398-5. This artist is notable for his place in the Fractal Art movement, as is his opinion and manifesto. ^ Mitchell, Kerry (1999). "The Fractal Art Manifesto". Fractalus.com. Retrieved 27 December 2015. ^ Hoke, Brian P. (21 August 1996). "Cellular Automata and Art". Dartmouth College. Retrieved 24 December 2015. ^ Burraston, Dave; Edmonds, Ernest (2005). "Cellular automata in generative electronic music and sonic art: a historical and technical review". Digital Creativity. 16 (3): 165–185. doi:10.1080/14626260500370882. ^ Bovill, Carl (1996). Fractal geometry in architecture and design. Boston: Birkhauser. p. 153. ISBN 0-8176-3795-8. Retrieved 28 October 2011. ^ Conner, Elysia (25 February 2009). "Meet Reginald Atkins, mathematical artist". CasperJournal.com. Retrieved 28 October 2011. ^ Eberle, Robert. "Evolutionary Art - Genetic Algorithm". Saatchi Art. Retrieved 25 December 2015. ^ Reynolds, Craig (27 June 2002). "Evolutionary Computation and its application to art and design". Reynolds engineering & Design. Retrieved 25 December 2015. ^ a b Chun, Wendy Hui Kyong (2011). Programmed Visions: Software and Memory. MIT Press. p. 2. ISBN 978-0262518512. ^ Ox, Jack (1990). The Systematic Translation of Anton Bruckner's Eighth Symphony into a Series of Thirteen Paintings. Bruckner Symposium 1990. Linz, Austria. ^ "Bruckner: Eighth Symphony visualized themes". Intermedia Projects. Retrieved 9 April 2018. ^ Ox, Jack (1993). "Creating a Visual Translation of Kurt Schwitters' Ursonate". Leonardo Music Journal. 3: 59–61. ^ Ox, Jack; Britton, Dave (2000). "The 21st Century Virtual Reality Color Organ". Journal of IEEE Computer Society. 7 (3): 2–5. Oliver Grau (2003). Virtual Art: From Illusion to Immersion (MIT Press/Leonardo Book Series). Cambridge, Massachusetts: The MIT Press. ISBN 0-262-07241-6. Wands, Bruce (2006). Art of the Digital Age, London: Thames & Hudson. ISBN 0-500-23817-0. Wikimedia Commons has media related to Algorithmic art. This page was last edited on 5 April 2019, at 20:21 (UTC).